This Book here gave me good time when i was given Glucose through IV in hospital. Not even one-fourth of glucose had passed and i was getting bored so demanded for a book from home,got this one .For next 20 mins i was completely involved reading this book.Good time killer :). 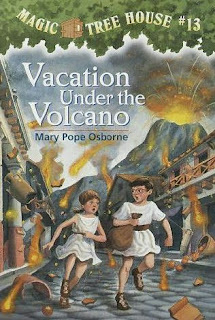 Well this Book is mainly targeted for primary school children but then again i'm not elder than them ;-) :-D .
The book is an interesting adventure of two siblings Jack and Annie .They are promoted as Master Librarians(ML) and given a ML Card .They are assigned a mission to recover ancient book from lost library in Pompeii.Spoiler alert!!!! 76 pages of worth reading ,story with morals and history.